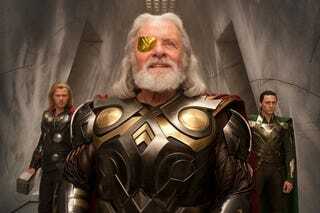 Asgard has caught up with Breaking Bad and, by Valhalla, it's a hit! Odin has spent the past 2 weeks (Midgard time) mainlining Breaking Bad and through his mortal avatar, Sir Anthony Hopkins, sent an effusive letter to Bryan Cranston praising the recently ended series. He hails Cranston's performance as"the best acting I have seen – ever" and "how the producers (yourself being one of them), the writers, directors, cinematographers…. every department – casting etc. managed to keep the discipline and control from beginning to the end is (that over used word) awesome." You can see the entire letter, which was originally published on Gomey and Skinny Pete's Facebook pages before being pulled, here. Heimdall on the other hand didn't think the show was all that and said he saw the ending coming 4 years ago.